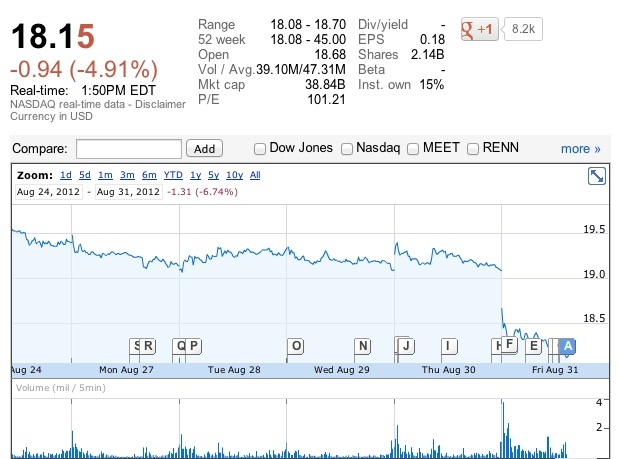 Facebook’s stock just hit a new low and has now lost more than 50% of its value since the social network’s IPO in May. This new record low comes after analyst firm BMO Capital Markets cut its price estimate on the company’s shares from $25 to $15 today. Research firm eMarketer also just announced that it expects Facebook’s revenue for this year will remain under the company’s previous estimates. eMarkteter now predicts that Facebook’s ad revenue will reach $4.23 billion for 2012. That’s up 34% from 2011, but eMarkter previously estimated that Facebook could reach ad revenues of up to $5 billion this year. Facebook’s stock already reached a new low earlier this month after its early investors finally got a chance to sell their shares on August 16. At that time, Facebook’s stock was still worth over $19.60, though. Today, the stock is hovering around $18.15. The initial IPO price for the company’s stock was $38. It’s worth noting that while the expiration of the last lockup period already put a lot of pressure on the stock, a far larger number of shares will become available for trading in mid-November when the next lockup period expires. MarketWatch’s Dan Gallagher notes that 271 million shares were released in mid-August, but 1.2 billion shares could hit the market in mid-November, which will likely put even more pressure on the stock price.